Is it Safe for Everyone to be Able to See My Windows Product ID? There is no doubt that valid Product Keys are a valuable commodity and need to be carefully guarded from theft. With that in mind, why is the Product ID so visible to one and all? Does this put your Product Key at risk? Today’s SuperUser Q&A post has the answers to a worried reader’s questions. Is it a cause for concern that everyone can see the Windows Product ID on my computer? What is my Product Key given the Product ID shown on my computer? 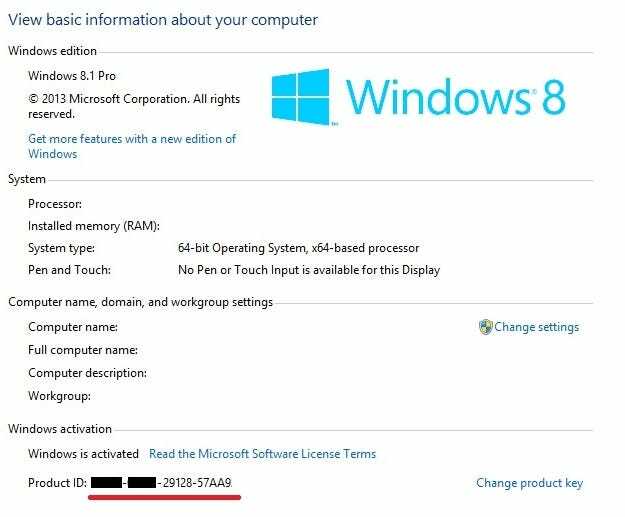 Should user3486470 be concerned that everyone can see the Windows Product ID on his computer? Product IDs and Product Keys are two different things and they have nothing to do with each other. Product IDs are created upon Windows installation and are used for technical support purposes only. The Product ID has absolutely no similarity with the Product Key used for activation. You cannot determine the Product Key if you know Product ID, and yes, it is safe for other people to see it. A PID (Product ID) is created after a product is successfully installed. PIDs are used by Microsoft Customer Service to help identify the product when customers engage Microsoft for support. A Product Key is a unique combination of numbers and letters that is used during Microsoft software installation to unlock or open the product. If you do not enter the Product Key when you are prompted during the installation, the product may not open until you enter the product key. Essentially, the Product ID can be tied to hardware, whereas a Product Key is tied to software. It is important to note that Product IDs are not only used for PCs with Windows installed on them but also for mobile devices, gaming consoles, peripherals, etc.